Q: Yesterday at an international conference in Tokyo, Japanese Prime Minister Shinzo Abe expressed his willingness of cooperating with China on the Belt and Road Initiative. What is China's comment on that? The Japanese side also hopes that top leaders of Japan and China will visit each other next year. How do you respond to that? A: On your first question, we have noted the statement by Prime Minister Abe. In the course of developing the Belt and Road, China is committed to establishing a set of fair, reasonable and transparent rules for international trade and investment together with countries along the routes. Guided by this principle, China has reached cooperation agreements with many countries under the Belt and Road framework which consists of all-round plans and specific projects for cooperation. The Belt and Road is an important international public goods, and an open and inclusive development platform, creating benefits for countries around the world including Japan. All parties are equal in terms of participating in, contributing to and benefiting from the Belt and Road. We believe that this initiative can serve as a new platform and test field for mutually beneficial cooperation and common development of China and Japan, and welcome Japan's discussion with us on conducting cooperation within the Belt and Road framework. We also hope that the Japanese side can translate their remarks and wishes about improving relations with China into concrete policies and actions. On your second question, the Chinese side attaches importance to and stands ready to improve its relationship with Japan. This is our long-standing position. We have noted the remarks of Japan and hope that the Japanese side can translate their remarks and wishes about improving relations with China into concrete policies and actions, abide by the four political documents and the four-point principled agreement with China, properly handle the relevant issue and work with China to bring the relationship back to the track of sound and steady growth. Q: The UN Security Council has unanimously adopted Resolution 2356 on missile and nuclear programs, including ballistic missile tests by the DPRK, adding more individuals and entities of the DPRK into the sanction list. What is China's comment on that? A: As a close neighbor of the Korean Peninsula, the Chinese side has been following closely the development of the situation on the Peninsula, and working for the realization of denuclearization, maintenance of peace and stability of the Peninsula and settlement of the issue through dialogue and consultation. That is what we have been upholding when dealing with the Korean nuclear issue and participating in Security Council deliberation. By developing nuclear and missile programs and using ballistic missile technologies for launches, the DPRK has obviously violated the Security Council resolutions. Resolution 2356 demonstrates the international community's opposition to DPRK's nuclear and missile programs. Meanwhile it reaffirms the commitment to peace and stability of the Peninsula and Northeast Asia and peaceful settlement of the issue through diplomatic means, and welcomes all relevant parties' efforts to that end. That is in line with China's long-standing position. The Chinese side hopes that all relevant parties can fully implement all the DPRK-related resolutions including Resolution 2356 in a balanced way, lay equal stress on non-proliferation and peace talks, and push for the peaceful settlement of the Korean nuclear issue. The current situation on the Korean Peninsula is complex and sensitive, and we are faced with a window of opportunity to bring the Korean nuclear issue back to the track of dialogue and consultation. The Chinese side hopes that all relevant parties will do more to de-escalate the situation, increase mutual trust, and refrain from words or deeds that may heighten the tension. We also hope that relevant parties will consider seriously China's suspension-for-suspension proposal and parallel-track approach, and work with China to promote dialogue and consultation, denuclearization, peace and stability of the Korean Peninsula. Q: David Rank, the Charge d' Affaires of the US Embassy in China has resigned over the Trump administration's decision to quit the Paris Agreement. How will it affect China-US relations, particularly in climate change? How do you think it will affect US diplomacy in this region? A: Personnel changes in the US Embassy in China are the business of the US, and I am not going to make comment on that. The China-US relationship is very important. The Chinese side will enhance bilateral, regional and global cooperation with the US in all aspects based on mutual respect and mutual benefit, and that will also include cooperation against climate change. Q: Did the US notify the Chinese side in advance of its withdrawal from the Paris Agreement? If it did, who conveyed the message? With the resignation of the US Charge d' Affaires, does China still believe that the US Embassy in China can speak for the US government? A: The whole world has noted the White House announcement of the US withdrawal from the Paris Agreement. The embassy serves as a bridge of communication between the sending and receiving states. We stay in close communication and cooperation with the US at different levels including via its embassy in China, to press ahead with our relationship and cooperation across the board. 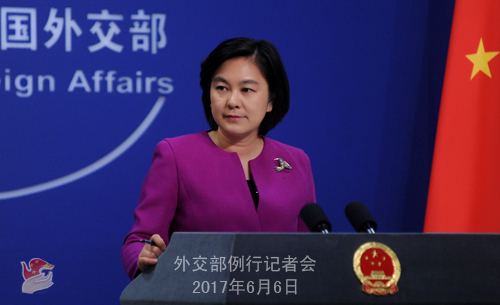 Q: Indian External Affairs Minister Swaraj said that India will take up with Beijing over the alleged violation of its airspace by two PLA choppers. What is your comment on that? A: The spokesperson of the Defense Ministry made an authoritative statement when asked about that yesterday. I want to stress once again that China and India have territorial dispute over the middle section of the boundary. The Chinese border troops conduct regular patrols there. We have border-related mechanisms, therefore when problems arise, the two sides should communicate and coordinate through the existing mechanisms and jointly uphold peace and tranquility of the border areas. Q: The Pakistani government has allocated US$ 1.7 billion for the China-Pakistan Economic Corridor (CPEC) and its supporting projects during next financial year starting on July 1. It is significant as the CPEC projects would enter into the third year of implementation. Would you like to comment on that? A: Thanks to the concerted efforts of China and Pakistan, the CPEC has entered the stage of full implementation, playing an important role in improving Pakistan's energy supply, traffic infrastructure and job opportunities, and giving a boost to regional interconnectivity. China applauds Pakistan's contribution to the construction of the corridor and will work with the Pakistani side to ensure the on-time completion and stable operation of the corridor projects so as to deliver benefits to people of the two countries, and promote regional peace, stability, development and prosperity. Q: My question is about the 31 detained Chinese in Zambia. Do you have any update on the reported last-minute delay on their deportation? A: The Chinese government pays great attention to Zambian police's arrest and detention of 31 Chinese nationals. 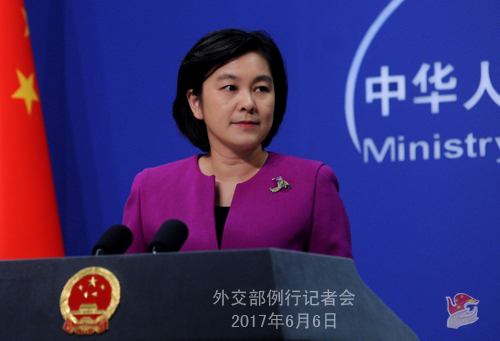 The Chinese Foreign Ministry and the Chinese Embassy in Zambia have repeatedly lodged solemn representations with the Zambian side, urging them to handle this case without delay in accordance with the law, not to extend the detention, and to release the innocent as soon as possible and improve the conditions for those detained. It is learnt that since the Chinese citizens involved failed to reach an agreement with relevant parties of Zambia on conditions for the removal of custody, they are yet to be released. The Chinese side has stepped up communication with the Zambian side, urging them to take concrete actions to safeguard Chinese citizens' lawful rights and interests. Q: Indian External Affairs Minister Swaraj also talked with the press about China having reservations about India's application for the Nuclear Suppliers Group (NSG) membership. She called on friends of China, including Russia, to impress upon China India's candidature. What is China's comment on that? Secondly, regarding the Belt and Road, she touched upon issues relating to sovereignty that India is concerned about. How do you comment on that? A: On your first question, non-NPT countries joining into the NSG is a multilateral issue which should be decided by all NSG members through consultation. The Chinese side is in close communication with other NSG members including Russia on this issue. All parties agree that a decision should be made in strict accordance with the NSG rules and mandate through consultation. The Chinese side has stated repeatedly its stance on India's joining. Our position remains unchanged. We support the group in handling the issue with a "two-step" approach through open and transparent inter-governmental procedures, following the principle of reaching an agreement through consultation. What is imperative is to work out a non-discriminative solution applicable to all non-NPT states, and on that basis, discuss applications filed by specific non-NPT states. The NSG plenary will be held this month in Bern, during which the Chinese side would like to continue with its constructive discussion with all the other parties on the relevant issue in accordance with the mandate of last years' Seoul plenary. As for the issue of Kashmir that India cares about, we have been saying that it is an issue left over from history between India and Pakistan, and should be properly resolved by the two sides through dialogue and negotiation. The CPEC is an initiative for economic cooperation. It does not target any third party, has nothing to do with territorial disputes, and does not affect China's position on the Kashmir issue. Q: It is said that countries like Australia, Japan, India, and Vietnam, while taking care that they do not upset Beijing, are seeking to bolster informal alliances unsettled by growing fears that the US cannot be relied on to maintain a buffer against Chinese assertiveness. What is your comment on that? A: I have seen the report but quite doubt its authenticity. If unfortunately, the report is true, it only tells us that the Cold War mentality is yet to be eradicated in today's globalized world, and that some people are still viewing and handling relations with other countries with a zero-sum approach. We uphold a concept of common, comprehensive, cooperative and sustainable security, and a new type of international relations with win-win cooperation as the core. We maintain that confrontation, alliance and containment lead nowhere, while dialogue, cooperation and win-win will prevail. 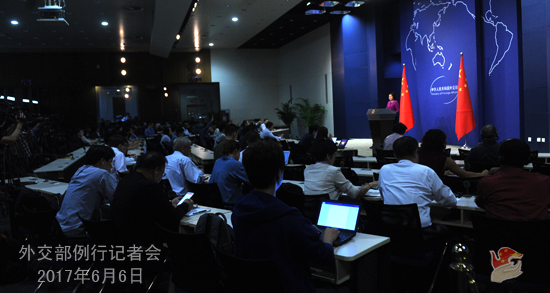 It is hoped that all relevant countries will look at China's development in the right way. Q: Australia has ordered an inquiry into espionage laws and foreign government interference amid growing concerns about Chinese influence in the country's politics. What is China's comment on that? A: I bet you were not here yesterday, since the ABC journalist asked that question yesterday, and I gave him the answer. The report is totally unfounded, full of speculation and not worth refuting. It is hoped that the relevant media can report on China's development and China-Australia relations in an objective manner, encourage friendly exchanges, mutual understanding, and greater cooperation between the two peoples instead of wasting time and energy on such kind of senseless report, which is nothing but malicious speculation. Q: It is reported that British Prime Minister May has called for international regulation of the cyberspace so as to curb the spread of extremism and terrorism. What is your comment on that? A: International terrorist organizations spread terrorism thoughts, raise fund, recruit followers, and plot terrorist acts with the Internet and social network as platform, posing grave threat to security of countries around the world. More and more countries have realized that fighting cyber terrorism is an important task of the international counter-terrorism campaign. China is a major Internet user, and victim of cyber terrorism. The Chinese side has been calling for international cooperation against cyber terrorism, and calling on the international community to strike cyber terrorism with a clear-cut attitude, strong determination and effective measures. Since 2014, we have held two seminars on cyber terrorism under the framework of Global Counter-terrorism Forum, driving forward international cooperation and capacity-building in the relevant field. The Chinese side has noted relevant statement by British Prime Minister May. We will conduct practical cooperation with the UK and other countries around the world in a step-by-step manner as a community of shared future, and with the UN as the center and platform, forge the maximum synergy in fighting cyber terrorism, and jointly create a peaceful, secure, open, cooperative and orderly cyberspace.